The River Royale is a nimble ship allowing passage in narrower rivers which makes it an ideal vessel for sailing on the Garonne and Dordogne. 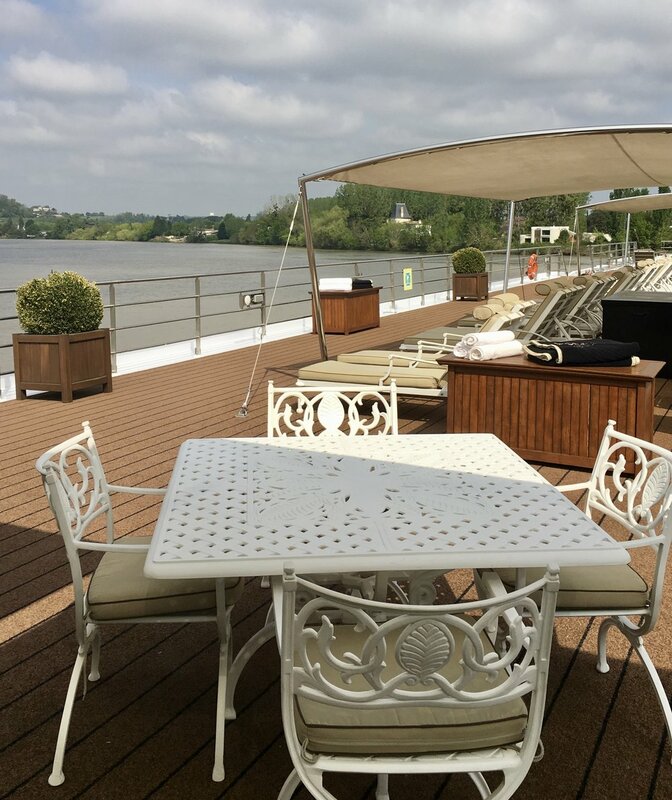 If you've read some of our other cruise posts you know we prefer small ships and Uniworld's River Royale was probably the smallest we've been on yet but it was just the right size to traverse the waters of the Garonne and Dordogne rivers with views of the Bordeaux countryside and its world-famous vineyards and chateaux on both sides. The ship carries just 130 passengers and on this shoulder-season cruise it carried about half that many which made for a very intimate cruising experience. The service aboard the River Royale was fantastic. Every crew member would go out or their way to help passengers with special requests or take the initiative to make sure everything on board was the best it could be for all guests. The polite and diligent waitstaff supported by an extremely attentive Maitre d' made every dining experience enjoyable and the sommelier dedicated to us all week was extremely knowledgeable about the great wines of Bordeaux. Because we were sailing short distances on this cruise, we had many of the same local guides each day but they met up with us in different towns and villages which made it nice to have some continuity. All excursions were included in the cruise price (with a few optional ones offered at an additional price) and were very good. We visited vineyards, did some wine tasting and visited a few chateaux. Larry and I both thought the excursions on this cruise were the most authentic, professional, educational and interesting of any excursions we've taken on other river cruises. We especially liked the "Go Active" cycling tours provided by Bordeaux A Velo, owned by a husband and wife team, who led three excursions during the week. They were so knowledgeable and passionate about Bordeaux and the history of the entire region. 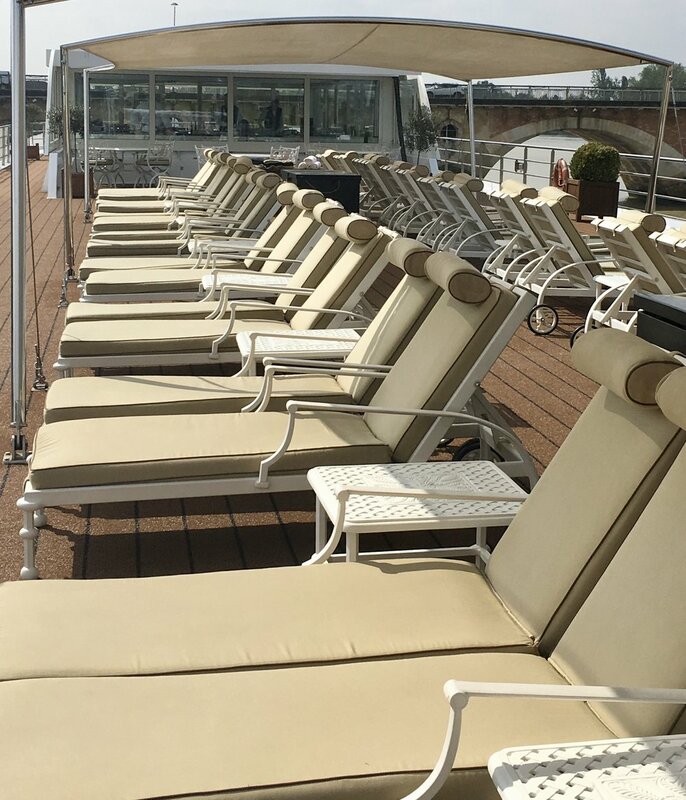 Another benefit of traveling short distances was the free time we enjoyed on the sun deck most days after excursions or during breaks in the afternoon. The scenery on shore is much different along the Garonne and Dordogne rivers than say, the Rhine or Danube. There are no towering castles but instead rustic, old fishing cabins on stilts and remnants of medieval ramparts and forts. The wine that makes this region so famous today was the result of nature's gift some 50 million years ago when this basin was a tropical sea. The vast quantities of sediment left behind now provide the soils and sub-soils so ideally suited to wine-making. The soil on the left bank tends to have more gravel and pebbles and the soil on the right bank contains more clay and limestone. It is these properties that give Bordeaux wines the distinctive character and exceptional quality sought by buyers worldwide. Spoiler Alert: 2016 is being touted as a remarkable vintage. An Indian summer followed by early September rains brought the grapes to perfect maturity. Some experts think the 2016 vintage will be the best in the last ten years and may prop up the dwindling interest in wine futures that the Bordeaux region has been suffering since the financial crisis of 2008 in the United States. Interest waned substantially and some big buyers in futures never came back. If you love river cruises and wine, you should definitely give this itinerary on Uniworld a look. We hope you enjoy our trip recap below and please feel free to contact us if you have specific questions about cruising with Uniworld or any other cruise line. And if you would like assistance in planning your vacation, we are a full-service travel agency and would welcome the chance to work with you. Please click here to contact Putnam Travels or to read more about us. The Pont Jacques Chaban-Delmas, opened in 2013, is the longest vertical lift bridge in Europe and is named in honor of a former Prime Minister of France and former mayor or Bordeaux. After spending one night in Arcachon and one night in Bordeaux on our own, we boarded our ship which was docked near the city centre of Bordeaux on the Garonne river. The river has a crescent shape that curves along Bordeaux's waterfront giving the port its name - Port de la Luna, or Port of the Moon. Europe's largest vertical lift bridge can be seen towering in the distance. The River Royale would overnight here giving guests who were just arriving in Bordeaux a chance to see the city. Bordeaux is beautiful at night so after dinner we took a stroll along the promenade to capture some of the evening's beauty. One site not to be missed is the Miroir d'Eau which was built in 2006 and is the world's largest reflection pool. Its field of granite covers 37,100 square feet and on some evenings a system beneath the granite turns the shallow pool of water into a fog of mist. The ornate Place de Bourse, is a city icon similar to Place de la Concorde in Paris and was designed by the same architect, Ange-Jacques Gabriel. It makes an impressive backdrop to the Miroir d'Eau both day and night. The "Pont de Pierre" or stone bridge is beautifully lit at night as well. This bridge was constructed from 1819 to 1822 and connects the the left bank of the Garonne river with the right bank. Once we boarded the ship we checked in at the lovely reception area highlighted by a Van Gogh-inspired mosaic mural. Finger sandwiches, fruit, beverages and pastries were laid out. This area became the "early risers" breakfast area for self-serve coffee, tea and pastries each day of the cruise. Our stateroom was small (151 sq ft), but had a large picture window for maximum river views and was designed efficiently for comfort and storage. Our stateroom featured a flat-screen TV, small table and chairs, built-in closets and a Savoir of England bed with Egyptian cotton linens. Bath amenities were from L'Occitane. The decor of the River Royale is a stark contrast to many other river cruise ships that have been recently remodeled with sleek and modern furnishings and neutral color palettes. Although my personal taste tends to lean toward neutral colors and modern design, I found that the elegant furnishings, rich fabrics and bold colors created a distinctive and compatible ambiance in which to discover the history of Bordeaux and the legacy of one of the world's most acclaimed wine regions. The Executive Chef on our ship was young, energetic and very personable. He made a point of being accessible to guests and took part in the culinary presentations. The main dining room had a very elegant setting and the alternative restaurant located on the top deck provided lovely views in the evening. I don't take pictures during meals but trust me, the food on this ship was probably the best cruise ship cuisine I've ever had. The attention to detail and service was exceptional. This was, after all, a wine cruise and Uniworld delivered on the theme. Our sommelier for the week was a young women named Aline who introduced us to the wines she had selected for each night's dinner. For guests wishing to order wine off the extensive wine menu (not included in beverage package), Aline was available in the dining room to assist with selections and make recommendations. There were three wine tasting sessions available aboard the ship with Aline during the week which took place in the Claret room. The session was included in the cruise but each guest needed to make a reservation. Aline gave an excellent presentation and we learned several new things about wine and how better to appreciate it. We did manage to carve out a little time to use the fitness center and the jacuzzi at the aft of the ship. The deck chairs and lounges were plentiful as were plush towels. The bartenders provided service on the deck and were constantly making the rounds to see if anyone needed anything. Our stop in Cadillac (pronounced "caddy ack") included a full day in the vineyards of Sauternes with a visit to a chateau Grand Crus Classes vineyard and tasting followed by and exclusive artisanal lunch and wine pairing. During the wine tasting at Chateau de Myrat we learned about the painstaking work involved in making Sauternes which makes this wine so unique. The grapes can only be harvested by hand with several passages through the vines to allow the noble rot (made from a fungus) to settle properly on the grapes which gives them their high sugar content and exceptional aromas. Sauternes are made from three grape varieties: Semillon, which gives sweetness and texture (70-90%); Sauvignon Blanc, which adds freshness (5-20%); and Muscadelle, for aroma (1-3%). Our group enjoyed a private, three-course lunch at Chateau de Cazeneuve, the royal palace first built in the 11th century and residence of King of France Henri IV and Queen Margot. Today, the estate is in the hands of their descendants, the ducal family de Sabran-Ponteves. Our lunch included a different wine pairing with each course so we could experience the vast differences between Sauternes. On this day we opted for the "Go Active" excursion which was a guided bike tour through Medoc vineyards with a stop for wine tasting at Chateau Legrange. Our tour guide, Paolo (of Bordeaux A Velo) led us on easy roads through gorgeous and historic terrain within sight of many storied chateaus you've probably heard of like Chateau Lafite-Rothschild and Chateau Latour, owned by Francois-Henri PInault, the seventh richest man in France, estimated to have a fortune worth US$ 19.5 billion. He recently bought the Araujo Estate in Napa Valley which he added to his holding company, Groupe Artemis which also includes Christie's Auction House and Stade Rennais Football Club. He's also the controlling shareholder of luxury-goods conglomerate Kering which includes the brands Gucci, Bottega Veneta and Puma and he's also married to actress Salma Hayek. Chateau Latour, the famed first-growth chateau made a commitment in 2008 to farm all of its 230 acres biodynamically. As you can see above, the chateau uses horses (not tractors) to plow its vineyards. Obviously, it takes a lot of money to operate a chateau and a sad fact about the chateau life in France is that many family owned estates have sold to large corporations, both foreign and domestic, because high operating costs and inheritance taxes have made it impossible for heirs to continue their family's legacy. China has emerged as a big player in Bordeaux wines. After the financial collapse in 2008, the U.S. buyers in Bordeaux wine futures dwindled and never really came back but China found favor with Bordeaux wines and began filling that void and eventually began buying chateaux. More than 100 Bordeaux chateaux are now owned by Chinese but it still only represents about 1.3 percent of the 7,400+ chateaux in the region. The city of Bourg is home to the Citadel of Blaye, a former Roman military base in ancient times. The headlands of Blaye became a Medieval village and the base was replaced by a fortress, the remnants of which can be seen today. Throughout history many changes were made resulting in the citadel becoming a modern system of defense. After WWII, the army sold the citadel to the town of Blaye and the site underwent restoration and protection. In 2007, the citadel was added to UNESCO'S World Heritage list. Today, the Citadel of Blaye is like a town within a town and includes a hotel, restaurant, souvenir shops and artist studios where you can purchase handcrafted, jewelry, linens and wooden toys. Certain days of the week the local market is set up within easy walking distance of the citadel. Blaye is also known for its marathon which snakes through the Bordeaux wine region and runners have the opportunity to do a little wine tasting at dozens of chateaux en route to the finish line. Saint Emilion is a quaint medieval village located in the heart of the Bordeaux region and is easily identifiable by the bell tower of its monolithic church. Saint Emilion is named after an 11th century monk who fled Britain to escape persecution by the Benedictine Order and lived in a cave for 17 years and was believed to be a performer of miracles. Guided tours of the cave and the rare underground monolithic church are available and there are many very good restaurants and wine shops in this village. Many bottles of wine for sale in these elegant shops had eye-popping price tags in the thousands! My favorite winery that we visited was Soutard which had two crystal chandeliers hanging in the vat room and a very James Bond-esque glass elevator to take guests down to the tasting room. Today, we started off with a tour of Libourne's city square and a stroll through the busy Farmer's Market to join the locals gathering fresh fish, produce and cheese for their weekend meals. Later we were joined by Christiane Saint-Laurent, wife of our previous bike guide, Paolo, who led us on the day's bike ride along the banks of the Dordogne river. Christiane was the first guide to offer cycling tours in Paris and later met Paolo. The two opened Bordeaux A Velo and know this region and its history so well which adds so much to their tours. On our last full day aboard the River Royale we were docked back in Bordeaux where we would overnight until disembarking the next morning. We opted for the "Go Active" bike tour with Christiane again. We cycled along the banks of the Garonne river and rode through the backstreets of Bordeaux. Again, Christiane impressed us with her knowledge of the viticulture, history, art and architecture of Bordeaux. The Place des Quinconces is one of the largest city squares in Europe (about 31 acres). The two columns in the foreground were erected in 1829 - one symbolizes commerce and the other, navigation. The column in the background was erected in between 1894-1902, in memory of the victims of the Reign of Terror during the French Revolution. The statue on top represents the spirit of liberty. This was probably the most active, yet relaxing river cruise we have ever taken. Each excursion was well executed, authentic and definitely complemented the wine theme of the cruise. 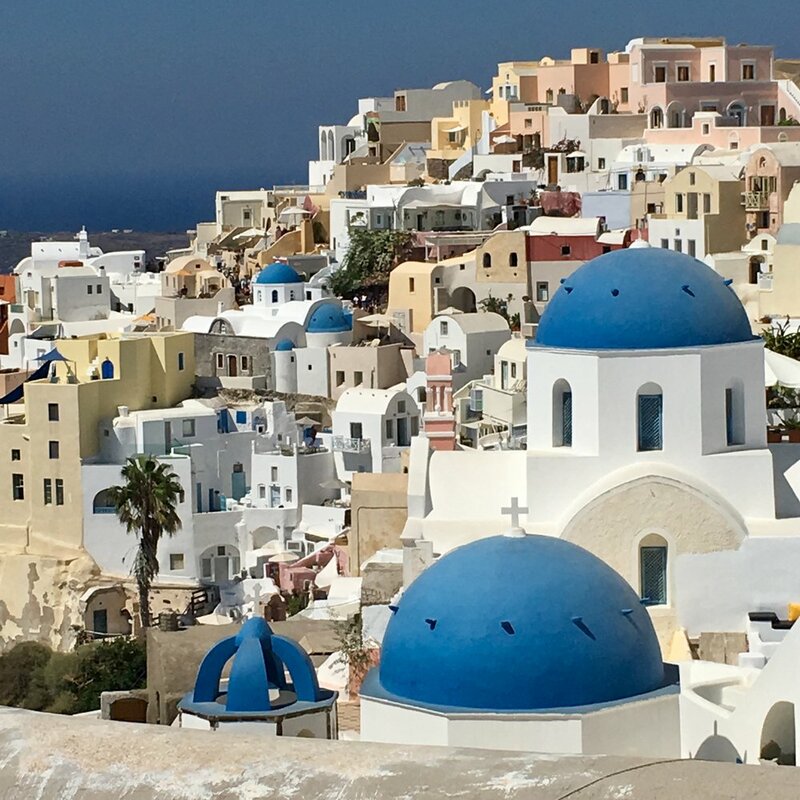 The itinerary left us with plenty of free time to see more of a port town on our own or return to the ship and enjoy the views from the sun deck. We left Bordeaux with a very good education and appreciation for its wines, history, landscape and people. If you'd like to contact us directly for more information about this cruise please click here. For more information on this Bordeaux Uniworld Cruises click here.